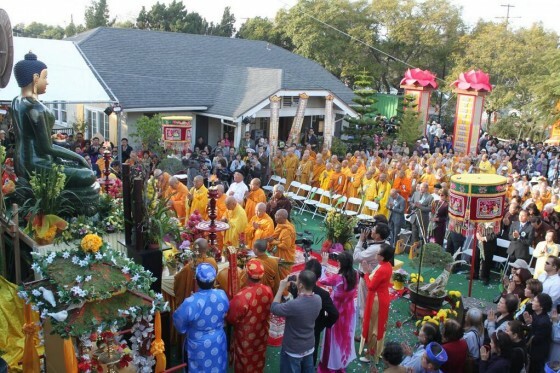 Opening ceremony for Jade Buddha for Universal Peace’s visit to Trung Tam Phat Giao To Dinh Minh Dang Quang in Santa Ana, California, January 2014. 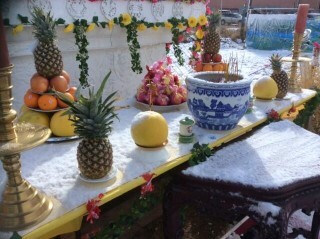 Photos courtesy of Ian Green / Jade Buddha via Twitter. Among the many holy object projects created by FPMT students, the Jade Buddha for Universal Peace stands out as a truly international project. Australian student Ian Green oversaw the creation of the Jade Buddha from the enormous Polar Pride jade boulder found in British Columbia, Canada. The boulder was carved in Thailand and modeled on the Buddha statue inside the Mahabodhi Stupa in Bodhgaya, India. Since 2009, it has been touring the world. The Jade Buddha for Universal Peace launched its North American Tour on January 2 at the Vietnamese Buddhist Congregation of the United States, Trung Tam Phat Giao To Dinh Minh Dang Quang in Santa Ana, California. The 4.5-ton (4-tonne), 8-foot (2.5-meter) tall statue of Buddha is carved entirely from gemstone quality jade. At the instruction of Lama Zopa Rinpoche, the Jade Buddha has been on a continuous worldwide tour dedicated to peace since 2009. 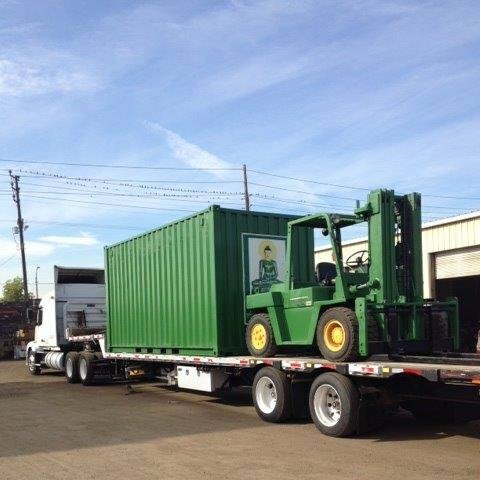 Before beginning its 2014 North American tour, the container in which the Jade Buddha travels, had a complete overhaul in Long Beach, California. The spruced up container features new storage and an easier-to-use crate that protects the statue when it is being moved around. 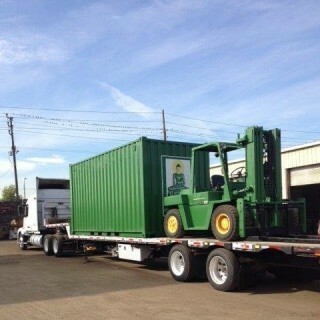 The tour also has a new, reconditioned forklift that goes with it from venue to venue. From California, the Jade Buddha traveled to Colorado and then Texas. The tour will continue non-stop through 40 cities in United States and Canada into 2016. The Jade Buddha has now visited 67 cities in 18 countries and over 7 million people have come to see it. 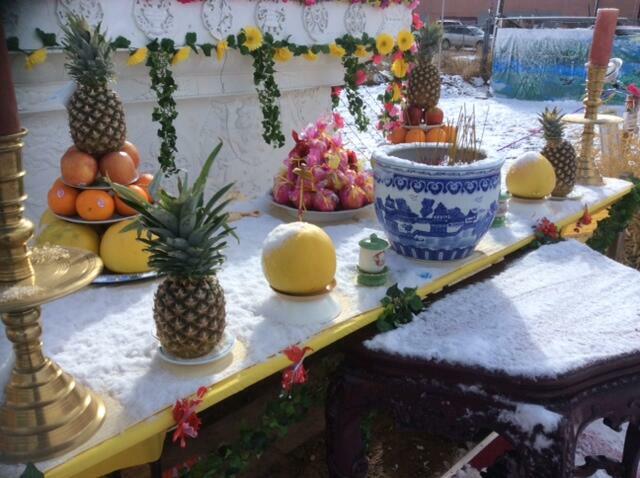 After North America, the Jade Buddha is booked to visit Korea, Japan and Vietnam in 2016. “I never thought it would turn into the phenomenon that it has become,” said Ian Green, founder of the Jade Buddha for Universal Peace and director of the Great Stupa of Universal Compassion in Bendigo, Australia. 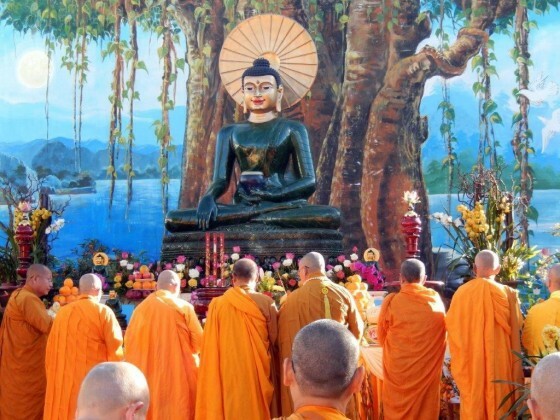 Read more from Mandala about the Jade Buddha for Universal Peace.